Are you staying in San Francisco, but looking for a SF to Napa wine tour? Look no further. Your San Francisco wine tasting tour experience will begin with a simple taxi ride from your hotel (or home) to the San Francisco Ferry Building. From there, you’ll enjoy a scenic ferry cruise across the bay. Enjoy a pastry and sip a Bloody Mary or Mimosa aboard the ferry as you take in the views on the open water! Our San Francisco wine tours allow you to enjoy both a unique water view of San Francisco’s famous landmarks and everything the Napa Valley has to offer. When you reach Vallejo, you will join Dynamic Napa Wine Tours for the ultimate San Francisco wine tours adventure. 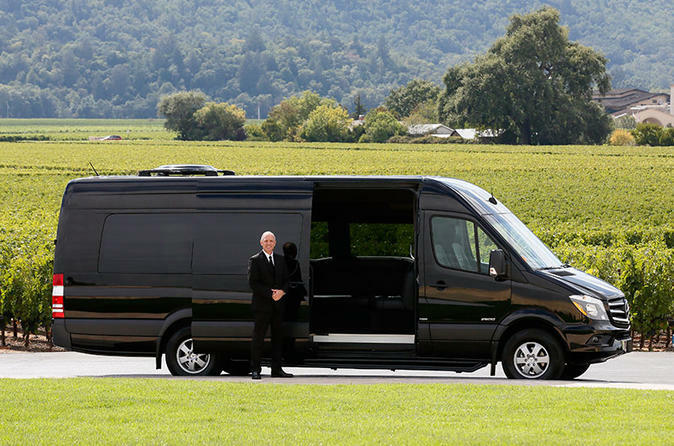 Once you reach Vallejo, you’ll board one of our comfortable, luxury Mercedes Sprinter limousines. Sip complimentary champagne as you whisk down roads lined with grapevines and old country farms. You’ll visit beautiful vineyards, explore underground wine cellars, and enjoy the friendliest wine tasting rooms. Our knowledgeable tour guides can answer all your Napa wine tasting tour questions. Indulge in a family-style, catered picnic lunch from “Girl & the Fig.” This exquisite farm-to-table restaurant boasts some of wine country’s finest local fresh ingredients. After the completion of the tour, you will be taken back to the Vallejo Ferry Terminal towards San Francisco. No planning is required when you take our Napa Valley wine tours from San Francisco. So, what are you waiting for? Book your San Francisco wine tour today!